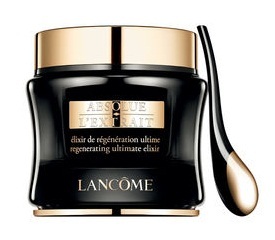 Lancôme's Absolue L'Extrait Regenerating Ultimate Elixir ($350) is pricey. That makes it a problem that I love it. Here's how it's marketed. An exceptional elixir exists. It contains up to two million Lancôme Rose native cells. Experience Lancôme’s revolutionary skincare innovation and our most powerful regenerating ingredient, Lancôme Rose Native Cells. Extracted from the heart of the rare and resilient Lancôme Rose using an exclusive, state-of-the-art biotechnological process, these native cells are proven to extend their own exceptional properties to enhance skin’s regenerative potential. Oddly, though perhaps not so oddly after the FDA's recent actions, there is a footnote online on the claim for regenerative potential. I can't find the actual note. Could it be that Lancôme has already removed the copy that claims cellular actions? Absolue L’Extrait is said to help reveal firmer, more elastic, and more radiant skin. Jocelyn Malinowski, Lancôme representative at Neiman Marcus Tysons Galleria, gave me samples that were sufficient to use this lovely serum-like moisturizer for two weeks. I loved it! Then I turned around and purchased the product. Never say that samples don't sell. According to Lancôme, a Fermogenesis process allows the Lancôme rose native cells captured in each jar to nurture the skin. There are supposed to be two million of these rose cells in each jar (which makes me wonder how many of these roses are required for production!). Forget the marketing claims and stick with me for a moment. This serum/hydrator feels great and makes my skin look good. It absorbs quickly, with a heavenly rose scent; leaves a soft, velvety feel; and it imparts an even tone and the radiance of healthy skin. Jocelyn said you can use Absolue L'Extrait as your serum, day cream, and eye cream. All you need to add is a sunscreen for day. I started using it cautiously, then I got daring and used it as an eye cream. Love! Lancôme recommends elaborate application instructions, basically starting with application of a pea-sized amount and ending with dual use of the gold-tipped wand (warmed by warm water) to first massage the skin in upward, circular strokes, then moving to upward gliding strokes. I don't have that kind of time. I apply this lovely extrait with my fingers and call it a day (or night). If you have any questions and would like to know more about Lancôme's Absolue L'Extrait Regenerating Ultimate Elixir, give Jocelyn a call. Maybe she can send you a sample. You can reach her at (703) 761-1600, extension 3282. Make sure to ask for her. She is the only Lancôme representative at the store. Of course, you can read up online. There is a short video at this link.